← Trader Joe’s Toasted Coconut Cookie Thins..You’ll like them… really, really, like them! These French candies are bon, bon, bon! These hard candies are worth a second look, or deja vu, if you like. Don’t be fooled by the cheaper varieties that you see in the candy dish at the bank. These are the Bentley to those Yugos. Here you have a sublimely flavored outer shell filled with the most delicious fruit filling, that is both smooth, and chewy. My favorite, as always, is black currant, but there isn’t a dud flavor among the whole group; there’s even an apricot, along with a marmalade flavor! Barnier is a French company that has been creating these sweets since 1885. They also make lollipops, but I prefer their little candies. 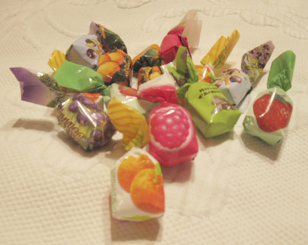 Each one is individually wrapped with a picture of the fruit. Look for the Barnier name, and you will be rewarded with a wonderful fruit taste. Sure, these are a little pricey, but they are worth it. The best price I’ve seen is on Amazon.com. Why, oh why, can’t American candies taste like this? Posted in Fruity, Hard Candy. Bookmark the permalink.